Hi everyone! I'm so excited to share my card for Pinkfresh Studio Januari Release Blog Hop! You must come from amazing designer Lea Lawson. So many amazing products and I have so much fun when playing with it. Here it is! I'm using Dye Ink Pad to stamp the images. For the background, I'm using Dye Ink with blending tool then splash water and watercolor with a brush. I'm using gold embossing powder for the images, color it using Koi watercolor marker then die cut it. The sentiment is from white embossing powder and for the background, I'm using Dye Ink with blending tool then splash water with a brush. I add some gold sequins for the embellishment. I stamp the images using Dye Ink then die cut it. For the background, I'm using patterned paper and gold glitter card stock. For the embellishment, I add some clear sequins. 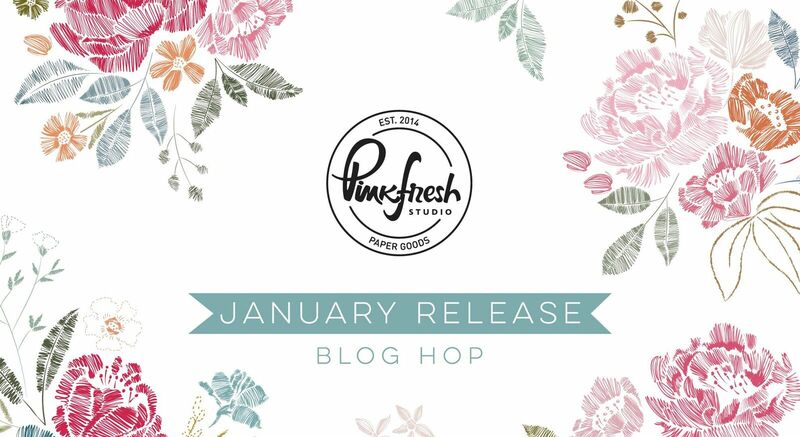 There's giving away the full January release on the Pinkfresh blog, and on Pinkfresh Studio IG feed. 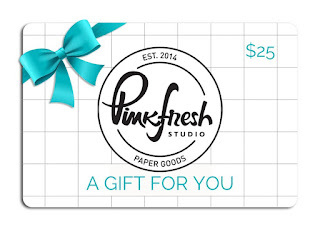 Each of you will be giving away a $25 giftcard on your blog post.. As per usual with blog hops - the winners will be picked from the comments. 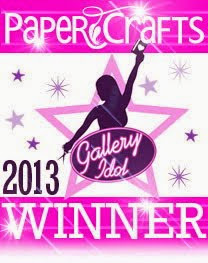 Winners will be announce & post them on Sunday, January 20th on our GIVEAWAY PAGE. Check out that page & claim your prize within 2 weeks. First is the free die (Dainty Love Balloon) with purchase of $25+. There is no code necessary, and the die will automatically load into their cart once they hit the $25 threshold. Pinkfresh will also be offering free/discounted shipping from January 14th-17th on orders $50+. You must use the code JANFREESHIPWITH50. Shipping is free in the USA, and $5.50 off for our International friends. Now it's time to see more amazing creations from Natalia Valkovskaya. Pretty cards, I really love the cake! TFS! Awesome cards! I so love this new release. So much to choose from. I especially like the embroidered flowers! These are all so warm and pretty! They would be a delight to find in one's mailbox, for sure! All are just beautifully done and inspiring! Great cards. Love your color choices. 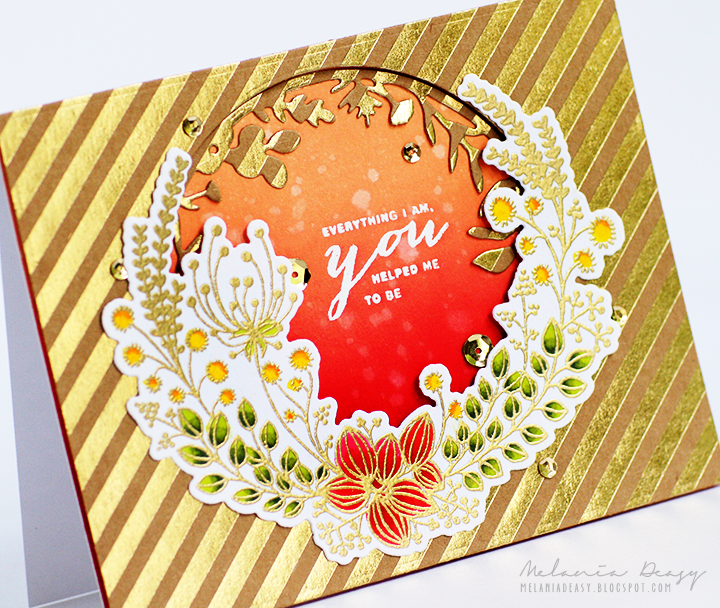 Absolutely love your coloring, great inspiration!Loved the beautifully blended background in the first card. Lovely cards as always, Deasy. Wonderful cards! I love that number 9 with a flame on top of it! Wow! These are so beautiful!! I love the gorgeous ink blending on the first card! Your work leaves me breathless. The bright colors are perfect for these products! Gorgeous gold details, love that spectacular cake card! Loving all the yummy gold in your cards; makes them quite elegant. I love the cake card. I always like using the recipients age like that on a birthday card (the younger ones anyway! lol). Awesome release! Love your cards, especially the birthday card. Great ideas! Melania, these cards are stunning! Your use of colors is really inspiring. 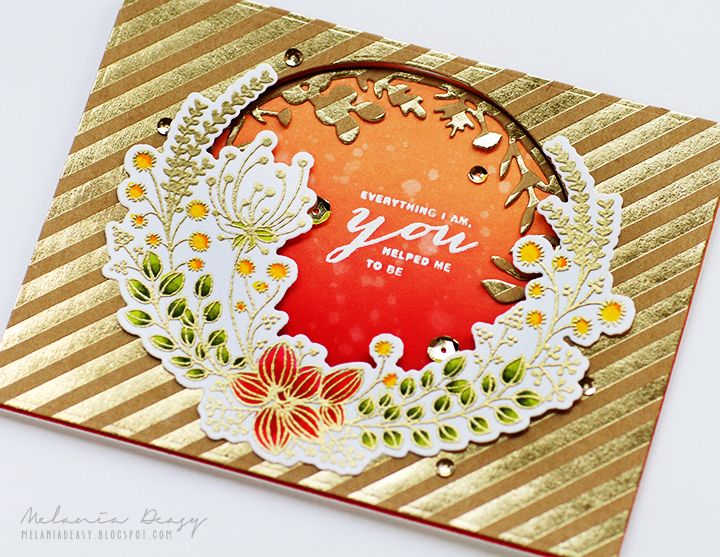 I adore the gold accents and use of embellishments to enhance these gorgeous new releases! Well done! 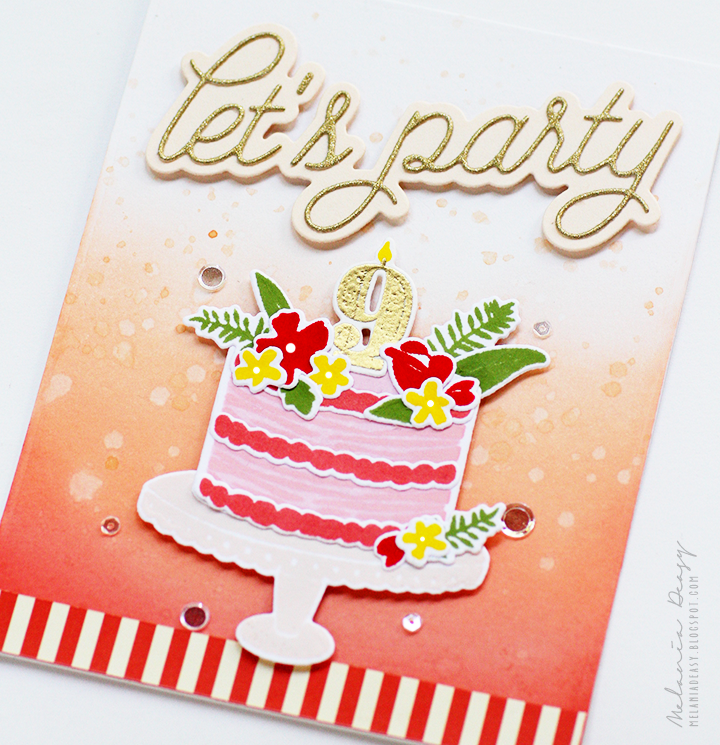 I love your cake card, so much fun! These cards are so gorgeous, Melania. Thanks for the great inspiration. I really love the new release. Not sure which is my favorite, they are all so lovely. Thank you for sharing them. Oh Melanie! I love the backgrounds and the BRIGHT colors! You did wonderful work! Yes let's Party! Wonderful! love the great cards made by this new release. hanks for sharing the release ideas. Beautiful cards, gorgeous colors, wonderful release. Awesome cards! I love how you customized the cake!!! And that cluster of flowers is absolutely gorgeous! Awesome cards especially loved the birthday design. boughs on the second card. All these cards are so striking! My favorite is the birthday card - festive and fun! Gorgeous! 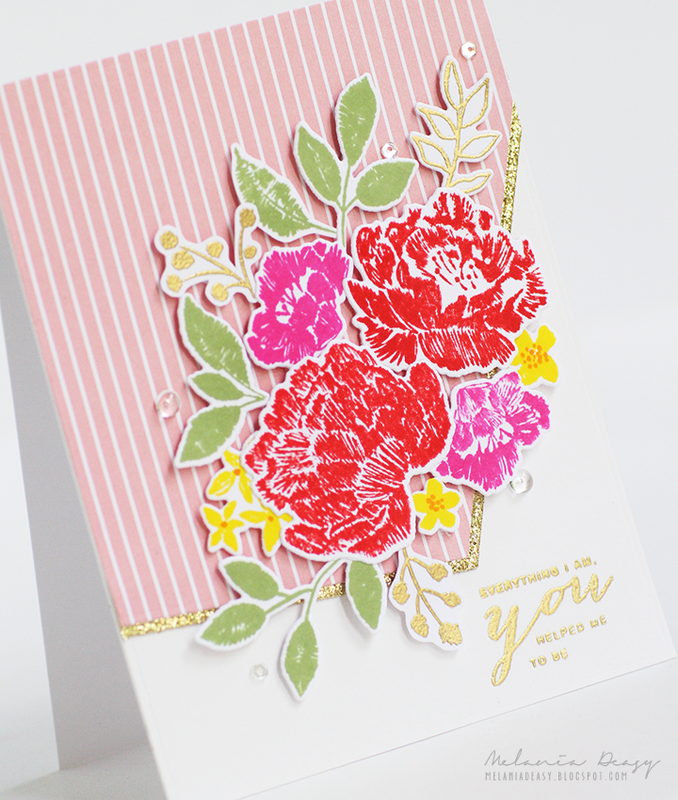 Love the angle on the floral card. Lovely cards with these beautiful new designs! I am really taken with the Make a Wish set, and your cake card is awesome! I love all the stripes, especially the gold and the beautiful flower arrangements. Beautiful cards! Lovely layouts and I love your touches of bold elements in the stripes and colors. Fabulous cards! They are so bright and cheerful. I love the birthday cake card. Beautiful cards, love the pink and coral colors, the birthday cake card is my favorite! 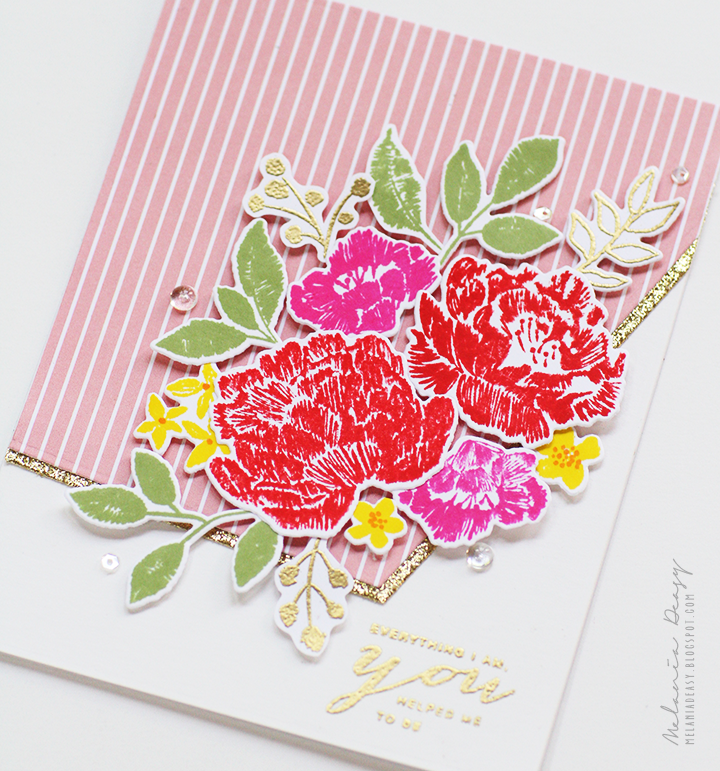 This is such a beautiful pairing of stamping and embossing that loos AMAZING! All that color welcomes in spring in a big way! Super fun cards. Love the bright colors. Melania, your cards are stunning!! I love the design, colors, the striped background,...just gorgeous! 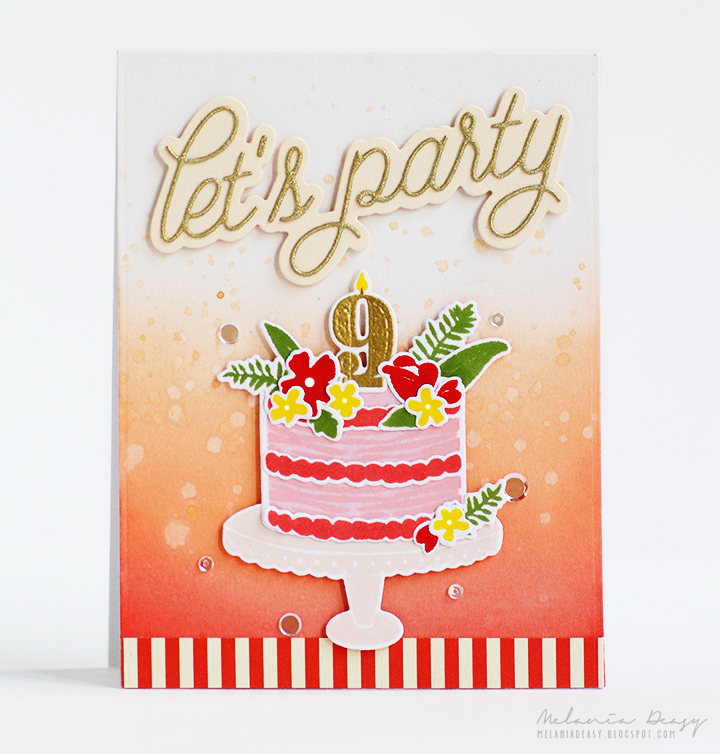 Love the cake party card! Looks good enough to eat!! Can't resist a shaker card!! Love the semi-circle of botanicals!! Can't get enough of the embroidered flowers! Sooo beautiful!! Great job!! Beautiful cards!! The new release looks amazing! Very pretty cards! I love the birthday cake! Beautiful, Melania! I just love the personalized birthday cake. It's such fun. superbes cartes, le gâteau est trop beau! A trio of beauties! Love the florals, bright colors and shimmer-y golds! Love all of the gold and bright colors!! Such a wonderful array of magnificent cards!! Thank you so much for all of the inspiration!! Great cards, all so colorful and lovely! Great cards and I love the colors. The scripty font with these flowers are beautiful! Fabulous cards. They are absolutely adorable and colorful. Your cards are really lovely! The gold stripes with the Heart and Soul flowers is a favorite. Beautiful! The birthday cake is my favorite! Your use of gold for accents is inspiring! Its just the right amount without overwhelming any designs but majorly enhancing them. I love the floral one with the golden V! These are all so gorgeous, it's hard to even choose a favourite. Although I think you posted them in the order of my liking- that cake one is truly wonderful! Beautiful colors! The embroidery effect is so lovely. 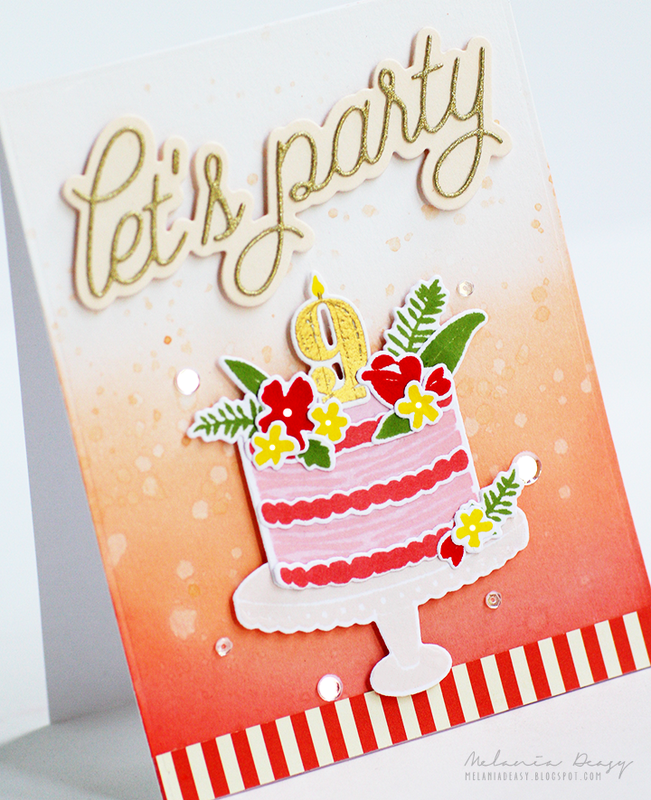 Bright and Beautiful, the Birthday card is so adorable the use of embossing is so pretty! beautiful cards! I love the gold accents! Your cards are very pretty. Your blended backgrounds are lovely and I like what you did with the botanical die. Beautiful cards! 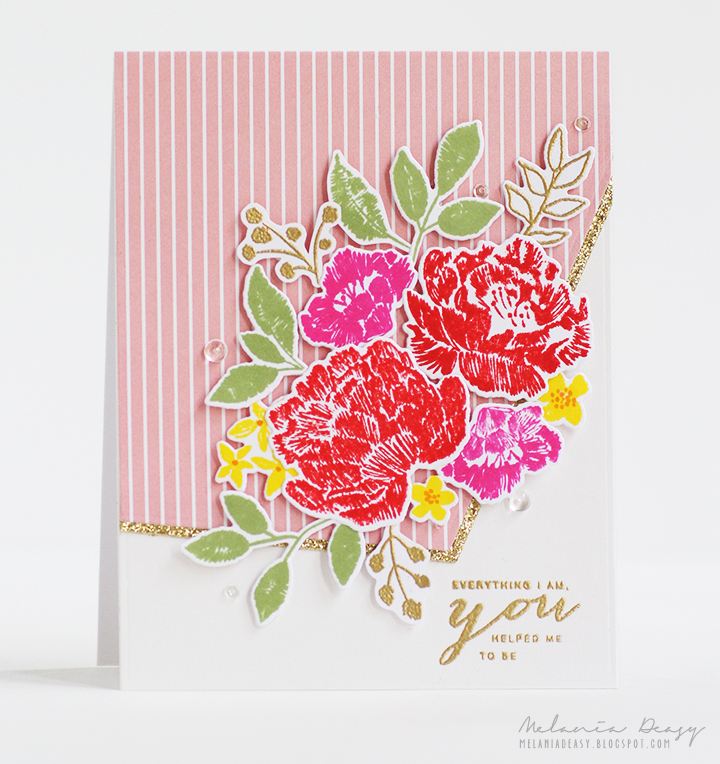 Love the gold accents and the wonderful vintage feel to the florals on the last card! Fabulous card designs. I like the colors and the touches of gold. The heart and soul card has the most gorgeous colors. The gold is right on with it. I really like your embroidered blossoms card and the gold stripe. Nice!!! Beautiful, Melania! I love all the gold & the awesome designs! Your coloring is perfection! I love the gold elements on your cards. They look AWESOME ! All of your cards re great! But I really like the birthday card..... The colors, the stamp and die... The whole she-bang! 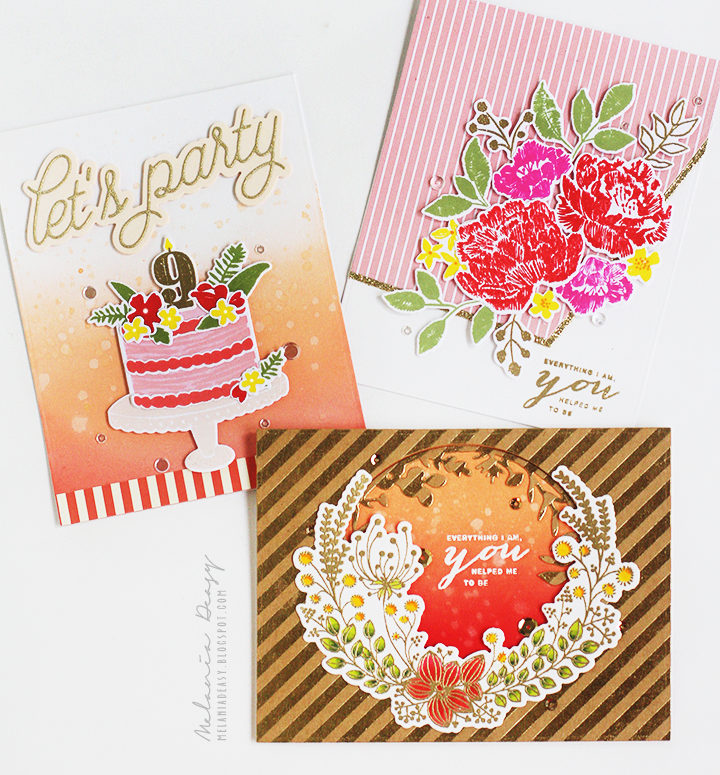 You've shared three lovely cards that are a beautiful showcase for the new products. 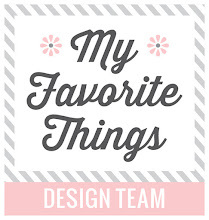 Your palettes and designs really make these products shine.